You’re Not Special: Great Commencement Speech by David McCullough Jr. RUSH: We’re nearing the end, ladies and gentlemen, of commencement address season. You’re nodding your head like you know where I’m going. There was the most amazing commencement address in Wellesley, Massachusetts. Have you heard about this? Yep. It is. This is June the 1st. The tape has just leaked. Now, we’ve had in this country for the last, what is it, 30 years in elementary school, secondary school, high school, middle school, junior high school, whatever the hell they call the stuff now, self-esteem has been one of the primary things that’s been taught. “You’re wonderful, little Johnny. You’re special, little Susie. You are unique, little Zeke. You’re wonderful.” It has been this way, as I say, for 30 years. And so a teacher at Wellesley high school at the commencement, an English teacher, David McCullough Jr., delivered the faculty address. We have four sound bites. Here’s the first one. MCCULLOUGH: Each of you is dressed, you’ll notice, exactly the same. And your diploma, but for your name, exactly the same. All of this is as it should be because none of you is special. You’re not special. You’re not exceptional. Contrary to what your U-9 soccer trophy suggests, your glowing seventh grade report card, despite every assurance of a certain corpulent purple dinosaur, that nice Mr. Rogers and your batty Aunt Sylvia, no matter how often your maternal caped crusader has swooped in to save you, you are nothing special. I remember my commencement address. I said, “The only thing that defines you right now is the kind of car you drive. That’s it.” I said, “You’re gonna hear that you are the future of the world, that the world is now on your shoulders. That’s bohunk. Nobody’s gonna depend on you. You don’t know diddly-squat yet. You haven’t experienced anything yet. There are adults older than you who are not just gonna lay down make room for you. You’re gonna have to push them out of the way. Oh, it was a satirical commencement. This is, again, a classic illusion illustration of how, if you listen to this program, you are on the cutting edge. So here’s this guy, David McCullough: “You’re the same. Your diploma, exactly the same. The only thing different is your name on it. You’re nothing special.” And he was just getting warmed up. Dawn, are you irritated by this? You don’t like this? I thought I detected a facial expression. Dawn transcribes calls to this program so I can read them if I can’t understand them. Cell phones are very difficult for me to understand, so she’s sitting in there and her face is getting contorted and so forth. I knew it. I knew it. (impression) “There are many exceptional students, Rush! There are many special students!” Well, there may be within that universe, but it doesn’t matter a hill of beans. They haven’t done anything yet! Getting out of high school is a pro forma act. Now, getting out of high school able to read your diploma? That’s an achievement. (chuckling) Here’s the second sound bite from the English teacher, David McCullough, at the Wellesley High School commencement on June 1st. MCCULLOUGH: And certainly we’ve been to your games, your plays, your recitals, your science fairs. Absolutely. Smiles ignite when you walk into a room and hundreds gasp with delight at your every tweet. But do not get the idea you’re anything special, because you’re not. RUSH: Ooh, ho-ho-ho! Oh-ho. Ladies and gentlemen, the dagger twists again. “Don’t get the idea you’re anything special.” Now, you can probably tell from the tone of my voice and my reaction that I think this is great. There’s a reason: It’s called “commencement.” “Commence” means what? Begin. Start. You’re at zero! Commencement means you haven’t done diddly-squat. Commencement means, “Get out there and get started.” Now, this bit about “kissed you, fed you, wiped your mouth, wiped your bottom,” he meant that in a hygienic way, folks. MCCULLOUGH: Across the country no fewer than 3.2 million seniors are graduating about now from more than 37,000 high schools. That’s 37,000 valedictorians, 37,000 class presidents, 92,000 harmonizing altos, 340,000 swaggering jocks, 2,185,976 pairs of Uggs. MCCULLOUGH: But why limit ourselves to high school? Think about this: Even if you’re “one in a million,” on a planet of 6.8 billion, that means there are nearly 7,000 people just like you. And consider for a moment the bigger picture. Your planet, I’ll remind you, is not the center of your solar system. Your solar system is not the center of its galaxy. Your galaxy is not the center of the universe. RUSH: And you aren’t the center of anything. How about that stat? “Think about this: Even if you’re ‘one in a million,’ on a planet of 6.8 billion, that means there are nearly 7,000 people just like you.” Now, I’m probably dating myself. I think this is long overdue. I’m the Mayor of Realville. This guy is telling these students the best thing they could hear — if they soak it in, if they accept it, if they understand it in the spirit in which he means it. He’s telling them: You’re not gonna get coddled out there the way you have been. You’re not gonna be celebrated. You’re not gonna be fawned over. Your bottom isn’t gonna be wiped by everybody that meets you and the world isn’t gonna stop when you walk into a room. And you better learn this very fast. There are a lot of people out there, and they all want the same thing you want, and they’re not gonna sit around and wait for somebody to give it to them. And if you do, you’re never gonna get it. They are gonna nudge you and push you out of the way. MCCULLOUGH: Like accolades ought to be, the fulfilled life is a consequence, a gratifying by-product. It’s what happens when you’re thinking about more important things. Climb the mountain not to plant your flag but to embrace the challenge, enjoy the air, and behold the view. Climb it so you can see the world, not so the world can see you. Go to Paris to be in Paris, not to cross it off your list and congratulate yourself for being worldly. Exercise free will and creative independent thought not for the satisfactions they will bring you, but for the good they will do others — the rest of the 6.8 billion and those who will follow them. And then you too will discover the great and curious truth of the human experience is that selflessness is the best thing you can do for yourself. The sweetest joys of life, then, come only with the recognition that you’re not special, because everyone is. RUSH: Selflessness is the best thing you can do for yourself. “The sweetest joys of life, then, come only with the recognition that you are not special” because he never is. David McCullough Jr. His father is the famed historian. RUSH: In a better world — in a better world, ladies and gentlemen — these kids at Wellesley High School would not be hearing that commencement address for the first time this late in their lives. How many of those kids heard that philosophy for the first time in their lives, do you think? They would have heard it, they would have lived it long before they were graduating from high school, in a better world. Reality. Realville. But all the things that used to introduce us to reality have been perverted now in order to increase our self-esteem. From tests, to sports, to grades. Lowering standards to become a cop or a firefighter for women. Lowering standards for entrance into college everywhere. In the interests of not hurting anybody’s feelings. In the interests of making sure everybody’s feeling fine and okay. And the problem is the real world isn’t like that. And I think — I really do think — some of the problems that we have in our culture involving crime and some of the problems we have culturally with a moral decline are rooted in this notion. She did tell me I was special. But I will give you the context of that when we come back. 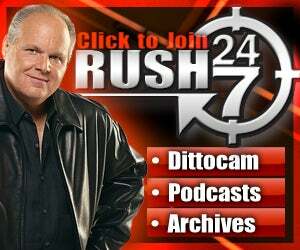 RUSH: Now, let me explain, ’cause I don’t want to be accused of being a hypocrite on this. My mother did tell me that I was special. Not because I was alive. Not because I had been born. It was after I had been fired the fifth time and I was thinking of just cashing it in radio-wise. I was 28 or 29 years old. I felt, “I’ve given this my best shot.” I was a deejay. Aren’t too many people 30 years old who are playing Donny Osmond records and succeeding at it. If I hadn’t moved on from that age, it was probably not going to happen. And I had everybody in radio that I had worked for telling me, basically, that I just didn’t have the talent. I was a hard worker and all that, but if I really liked broadcasting, I should stay in sales or something like that. And my mother had remembered that I once, when I was at a station in suburban Pittsburgh, did something hilarious. Lily Tomlin was in town to promote a movie or something she was doing. And at the time, her character was Ernestine the Telephone Operator on Laugh-In. And the PR people for Lily Tomlin had her doing appearances on all the radio stations in town. And the appearance that she did on my show (it was a morning show), I said, “Look, let’s do a thing where I call a grocery store and ask ’em if they have any frozen fried-raccoon TV dinners. And you, the operator, interrupt me, saying you’re monitoring calls for the phone company and the government. And you say it’s outrageous. There’s no such thing. And even if there is you’re gonna report me. And we’ll just wing it and take it from there.” So she laughed about it, and we did. And I sent the tape home to my mother. And she said, “You know, that was funny. That was special. You do have talent.” My mother was telling me that I was special in that I did have the talent to do what I wanted to do, and to not listen to all these other people and to not quit. But she was not telling me I was “special” simply because I was alive. She was not. In fact, I’ll tell you, folks. For those of you who are close to my age, this is gonna sound awful familiar. I remember when I was growing up. You know what the operative adult motto was? I want to tell you a story, and I want to get the details and the context right on this to show you that that had changed. And I was blindsided by this. There was a dinner party, and it was adults. Without having to be stated, it was adults. It was 16 adults. And the hostess… This is 20 years ago. The hostess calls and says, “I don’t know what to do.” “What, what, what?” Well, one of the people she’d invited was insisting on bringing her two kids. And the hostess really wanted the person there but didn’t want the kids. She didn’t know how to say it. That would have never happened when I was growing up… My parents would no more have said, “Well, yeah, if we can bring Rusty and David, then we’ll come.” It would not have happened. I remember teachers, my dad telling me, “You think the world owes you a living?” That was something my dad, when he got mad at me, would throw at me. “You think the world owes you a living?” You know, because every kid is self-centered. By human nature. And the whole thing — “Money doesn’t grow on trees” and “Do you think the world owes you a living?” — is about that. Obama believes the country owes people a living. I believe… I honestly believe that, as I just told Snerdley during the break. I think Obama is a classic example of what this teacher was warning about. I think Obama, his whole life, has heard this. One of the ways to explain him is that he was taught how “special” he is. If he needed an A, some teacher gave him an A when he only deserved a C. The way was paved for him, and he has trouble dealing with criticism now. He has trouble dealing with people not reacting in awe. He’s the embodiment of it, the walking embodiment of it. Anyway, it was just refreshing to hear this. I vowed I was never gonna do that. And now, it’s constantly on my mind. I don’t want to sound like an old fuddy-duddy, but there clearly are right ways and wrong ways to do things. There are right ways and wrong ways to prepare children for later life as adults. And we’ve been engaged in too many wrong ways. Like: No score in sports, no humiliation if you lose, everybody wins, everybody feels good. That’s not life. The whole notion of “fairness” is a myth anyway. It’s not possible, and it’s precisely for the reason that Mr. McCullough said here. We aren’t special because everybody is. Everybody has different talent levels. Everybody has different levels of ambition, desire, stick-to-itiveness. It’s like the news that’s come out in the past two weeks that exercise actually hurts some people. Yeah, because people are different. We have all of these efforts to cocoon everybody and to make everybody the same, particularly when it comes to outcomes. And it’s a political agenda that’s behind that. It’s a leftist political agenda that’s behind it, and it doesn’t serve anybody. And it leads to later problems that probably will never be diagnosed properly as having roots in this notion that life is painless and that you get what you want because you’re special. And so if this notion of entitlement is implanted in you, and if it’s something you’re raised with, and if it’s something that you graduate to adulthood with… This sense of entitlement, for whatever reason. “You’re an American, you’re entitled; you’re special, you’re entitled.” I would maintain that one of the outgrowths, one of the greatest illustrations of the problems with this is the arguments that are now being had, state by state, over lifetime pensions and lifetime health care for retired municipal employees. You have an entitlement sensibility. People feel entitled to this. And, by the way, that’s gonna be a central focus of the program today, as a bunch of Republican governors are all of a sudden now getting steel spines thanks to Scott Walker. Yes, my friends, a bunch of Republican governors are now telling Romney, “You better remember what Scott Walker did.” Republican governors. You know, it coulda gone the other way. If this recall woulda gone the other way, we would have not had a single Republican governor with a steel spine, much less a spine. I’ll explain all that in detail with sound bites as the program unfolds before your very eyes and ears. MCCULLOUGH: Twenty-six years and two hours. I’ve been teaching high school kids for 26 years. In that time, one comes to see what kids need to be told. These are wonderful kids. One grows very fond of them and proud of them, but that doesn’t mean you should indulge them with things, with platitudes or false encouragement. I wanted to give them a notion that with their privilege comes responsibility. RUSH: We’ve been parodying this for 20 years. His dad’s the famous historian, David McCullough. We parodied this 20 some years ago. “Little Johnny, how much is two plus two? Five? Right, little Johnny!” We’ve been parodying this for I don’t know how long. He continued. MCCULLOUGH: Part of this, too, is the way they’re being raised. Like I said, they’re doted upon. And I must say that I’m as guilty as anyone. I have four children, three of whom are teenagers. We’re raising them in the same way the people of Wellesley are raising their kids. The people of Wellesley are good people. You know, people with means see opportunities for their children, and they think, “Great, why not,” and they start over-scheduling their kids, and with these opportunities come expectation, and the kids feel the strain of those expectations. They understand that what they’re supposed to achieve with all they’ve been given is an Ivy League admission. RUSH: Wait a minute, now, isn’t that — what is it — contradictory? That’s the first thing he said that’s contradictory. With these opportunities come expectation. Kids feel the strain of these expectations. How do they feel the strain of anything when they’re told they’re special? I know what he’s saying. I mean I think the kids feel that on their own. Now, I’m not disagreeing. Parents implant that, and it doesn’t have to be Ivy League. I mean you grow up in southeast Missouri and getting into the University of Missouri is the same thing as some schlub from Boston getting into Harvard. Believe me. The same kind of pressures exist, and the pressure’s genuinely derived from what was considered status when the parents themselves were growing up. And of course that always changes. RUSH: Hey, get this. David McCullough Jr.’s commencement has now been viewed over half a million times alone on YouTube, just over half a million times in that one place. Imagine now after having aired it here. So being told that you aren’t special is such a novel experience, kids are seeking it out. Half a million can’t believe this, they’re seeking it out, trying to find it. It’s excellent.